Podcasting is a quickly emerging medium. With the increasing bandwidth now widely available, people are spending more and more time online and demanding more multimedia content. This series is specifically aimed at travellers and field recorders (rather than home-studio podcasters) and will serve you well in submitting material to the Matador Network or for starting your own production. Hardware sounds simple: a microphone and a recording device are the basic ingredients. The key, however, as you’ll hear below, is in the quality. Most laptops have built-in microphones, but few are high quality. However, with a little creative sound engineering, your built-in microphone can produce good enough quality sound. The difficulty is that the computer makes all sorts of noise which is very close to the microphone: it’s impossible to eliminate this although it can be mitigated in post-production. Getting your microphone some way from the laptop is a good idea: perhaps a USB headset like you would use for gaming or Skype calls would do the trick. You can immediately hear the difference in background noise although there are a few pops caused by the microphone being too close to the speaker’s mouth. If you would like to get away from the laptop for more freedom and portability, then a “cheap” portable recorder might be what you’re after: unfortunately “cheap” starts at US$150. Three popular field recorders for podcasters are the M-Audio Microtrack II, Marantz PMD-620 and the Zoom h2 Handy Recorder. After extensive research — focusing on these three choices — I bought a Zoom H2 last month and can definitely recommend it as a great microphone for travel podcasters. It’s light, runs on ubiquitous AA batteries, records to SD and can simulate surround sound thanks to the four microphones within its head. Current Matador podcaster Ryan Libre has been using a sony ICD-SX68DR9 Digital Voice Recorder with an external mic. Drew Leifeit, of Budacast fame, uses a Sony Hi MD Recorder (MZ-M10) for use in the field. In the ‘studio’ he uses a Audiotechnica AT835A shotgun mic, and in the field a generic stereo mic which came with the recorder. You can immediately hear the difference — as well as appreciate his great use of music. Matador writer and podcaster Julie Schwietert recommends using an Olympus digital recorder for making audio notes. In a pinch it can scrape by as a podcast-quality recorder. 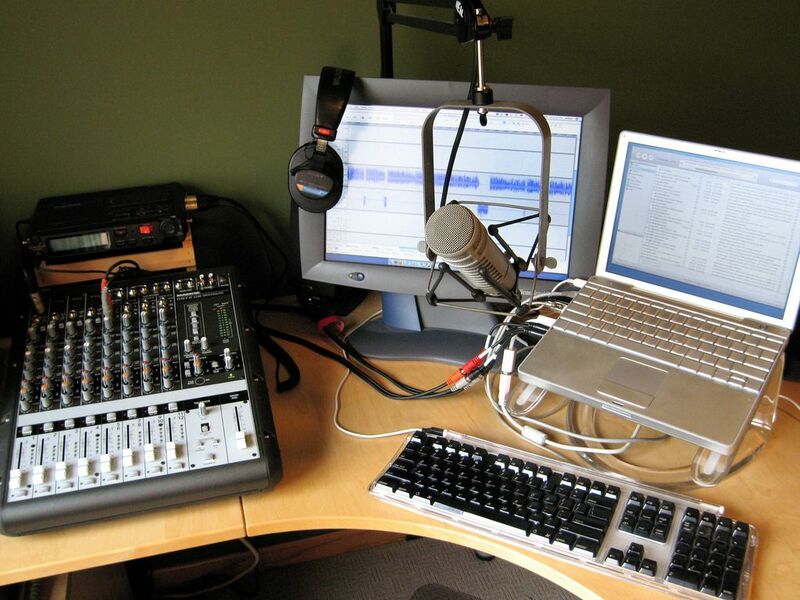 There are a growing number of good applications for podcasting on both the Windows and Mac platforms. In the Apple world, Garageband is undoubtedly the easiest way to get started: it’s already installed on your computer, it’s user-friendly and it’s the only recording software which also allows you to create iTunes-enhanced podcasts. Audacity is a free and open source cross-platform editor which is growing in stability and features. In the mid-price range, Adobe’s Soundbooth provides near professional-level control. This is probably overkill for beginner podcasters but could be an upgrade if you’d like to take things futher. Skype is a very popular computer-to-computer and computer-to-telephone telephony system. Using it, one can cheaply record interviews with fellow travellers who are miles away. You can also use it to call your mum, but I don’t think you should put that on air. Skype is able to be installed on Windows, Mac, Linux and many portable platforms. To download and install it, visit the site and follow the instructions there. But you probably want to know how to record the conversations. Read on. There are several workarounds to record Skype calls on a Mac, but by far the easiest tool is Audio Hijack Pro from Rogue Amoeba. With one click this program will “hijack” the audio and with one more click it will start recording. The program is currently priced at US$32, but there is a free trial version which allows 10 minutes of recording at a time. Budget-conscious podcasters can keep hitting start/stop to create several audio files. Once again there is a plentitude of options for recording Skype calls on Windows. The most popular seems to be Pamela, which also offers many more features. The free version gives 15 minutes of recording time. Now you have some hardware and software choices to make. Come back next week for part two in this series on how to start travel podcasting, and learn how to use it.